They had nearly reached the hidden ship that was their escape route from the planet, when they heard the rumble of a dropship above. 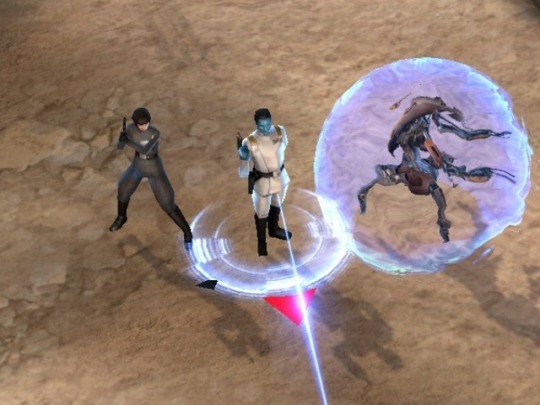 Thrawn stopped short, and Arihnda nearly ran into him. "What do we do now?" He narrowed his eyes at the squad of helmeted and armored rebels that were still getting their bearings after leaping from the dropship. There were four of them, armed with rifles. When he was hit, Arihnda filled with icy calm as she took the last rebel down with her blaster. As I post this there is one week left until the Star Wars:Force Arena servers go down for the last time. It's been my favorite timekiller for the last year or two, and I am very sad to see it go. My main fighters were Sabine/Fenn Rau for the light side, and of course Thrawn/Arihnda Pryce for the dark side. I was endlessly amused by the way her main skill was recharging his energy, and how she would spend her time passively running after him right until the moment he was killed. Then she turned into a fierce fighter, running for the nearest foe and attacking them ruthlessly until she went down. Adieu, Force Arena, I will remember you fondly. This little drabble will have to serve as my homage to you.